SCAI The Bathhouse has been taken over by sinister, sentient machines. 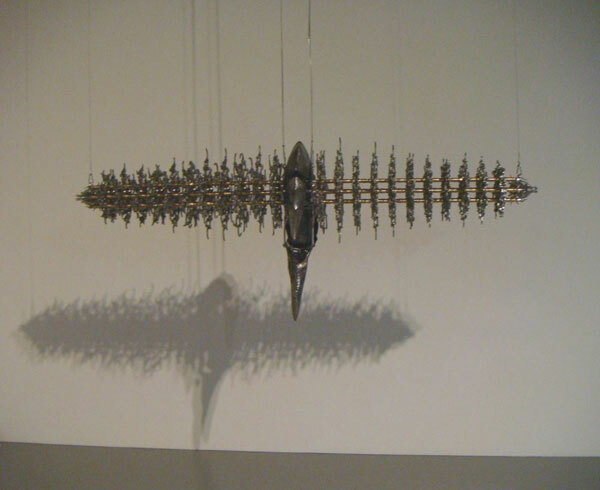 Choe U Ram "Anima Machines"
Korean artist Choe U-Ram draws on his knowledge of cybernetics to create kinetic sculptures. At his solo exhibition for the MAM Project Series at the Mori Art Museum in 2006, visitors found themselves being loomed over by a giant structure like a mechanized extraterrestrial plant, opening and closing while pulsing with light. Around it hovered mysterious, skeletal creatures like those we see in video footage of the ocean floor. Similar works are currently on show at the Asia Triennale taking place in Manchester, UK. However, while U-Ram’s works are typified by organic forms such as these, the sculptures currently on display at SCAI The Bathhouse seem to dwell less on the wonder of the natural world, and delve more into its sinister edge. 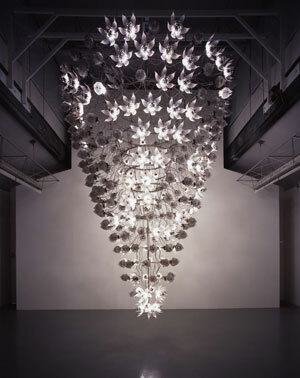 At the centre of the dimly lit gallery hangs Una Lumino (2008) a large, chandelier-like structure of translucent plastic flowers. The petals open and close and inside of them metal-halide lamps pulse on and off in a variety of sequences that cast patterns of white light across the whole structure. The tiny whir of the mechanism that opens and closes each of the flowers builds up into a crescendo of clicking and rustling that sounds like hordes of beetles are scurrying across the floor of the gallery. Observed close up with their petals retracted, these open flowers feel like staring eyes. Exposing the jagged mechanisms contained within, they resemble futuristic weapons aimed at your face, cocked and ready to fire. All kinds of imagery from Sci-Fi cinema come to mind, from the whirring, malevolent machines in The Matrix, to HAL’s impassive, all-seeing gaze in A Space Odyssey 2001. One wonders if some vile biological entity might even shoot out of these buds, like the screeching, fanged appendage that lurks within the jaws of Ridley Scott’s Alien. This sense of a nascent life form seeking a host to cling to is palpable when faced with Untitled (2008), a horizontal, larvae-like entity, bisected by a tapering carapace that droops towards the floor. Its entire body is constructed of the cogs and crankshafts that power dozens of little hooks that arc like handcuffs. Its form alone visualizes the scuttling insect legs implied in the rustling sounds that emanate from Una Lumino. Suspended from wires like a captured live specimen, it remains still for minutes at a time before its dozens of legs burst into a sudden frenzy of clawing back and forth through the air, as though desperately trying to break free and grasp hold of something. Perhaps it were able to sever the wires, it would fall to the floor and scuttle off into a corner. As you would expect in any gallery, a sign on the wall next to the work reads “Please do not touch.” Don’t. It might not let go. Meanwhile, another untitled work clings to the wall opposite like a starfish, silent and unmoving. 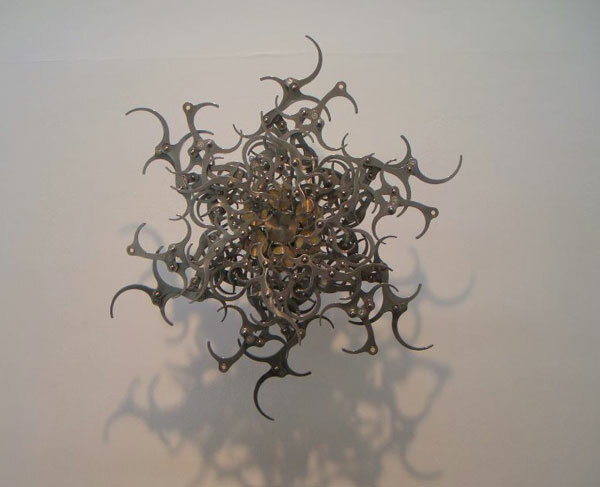 Unmoving, that is, until its tendrils, which resemble a matrix of handcuffs, slowly begin to rotate, all the while contracting and expanding around its centre, casting tangled shadows on the wall. Not only do the works in this exhibition explore the unknowability of nature, they are presented to us as parasites of urban infrastructure that threaten to encroach on the man-made environment. Out here in Yanaka, a neighbourhood of temples and old Tokyo shopping streets, far away from the energy-intensive centres of Tokyo where these beings are purported to thrive, it is not hard to remember that these are just artworks and that the text written about them is nothing more than contemporary myth-making. Nevertheless, Choe U-Ram’s work and the folklore he has created for it is the ultimate vision of the future: one in which humans and sentient machines co-exist in the urban environment. When you next find yourself into the neon-saturated streets of Shinjuku, Shibuya or Ginza, remember to look up above street level. Maybe one day they will be up there, affixed to the side of a neon panel, feeding, twitching, growing. Watching.